During the presentation. 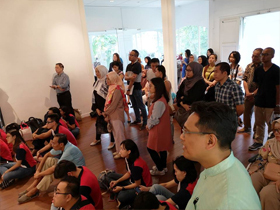 On 12 January, JCC jointly hosted with Ship for Southeast Asia and Japan Youth Programme (SSEAYP) International Singapore a welcome reception celebrating the homecoming of the 45th batch of SSEAYP participants. SSEAYP, is a unique 50-day voyage with over 300 youths from ASEAN countries and Japan that visits Japan and several ASEAN countries to promote cultural and international understanding. Since it was launched in 1974, over 11,000 youths have participated in this exchange programme. 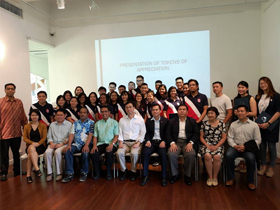 H.E Ambassador Jun Yamazaki delivered welcoming remarks and noted the significance of this youth exchange programme that has fostered friendship among youths from ASEAN countries and Japan. 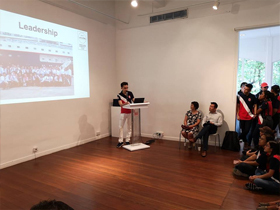 It was followed by a speech from President of SSEAYP International Singapore Mr Yacob Hussain as well as participants’ presentation sharing their experience of the voyage. 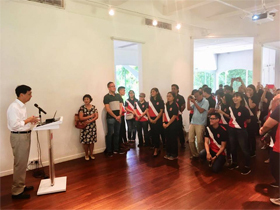 Representatives of ASEAN, diplomatic missions in Singapore, as well as ex-participants, host families, government representatives of Singapore were also present. We hope all participants were able to make lifelong friendships. Ambassador Yamazaki addressing the guests. One of the participants sharing his experience.